With 2014 behind us, let's take a look at some of the factors that influenced markets last year. With the economic recovery in its fifth year, 2014 was the year in which Americans finally became confident in the economy and their financial prospects. Despite several short-term pullbacks, 2014 was unambiguously good for the stock market; the major indices turned out solid performances, reaching multiple record highs in 2014. For the year, the S&P 500 gained 11.39%, the Dow rose 7.52%, and the Nasdaq gained 13.40%. A sudden decline in crude oil prices gave markets the jitters in the final weeks of the year. Since its June high of $115.19/barrel, Brent Crude lost over half its value, falling to $53.46/barrel at the close of the year. Oil prices slid on a combination of high supply volume, caused in part by rising U.S. shale oil production, and expectations of lower global demand. Equity markets reacted nervously to crude oil's slide largely because of the economic implications for oil producers like Saudi Arabia and Russia. These countries depend on oil revenues to balance their budgets and make debt payments; prolonged lows in oil prices could threaten their economic stability and hurt U.S. companies that do business overseas. Gasoline prices followed oil, bringing the national average price to $2.299 at the end of December. Cheap oil is a mixed blessing for the economy. On one hand, lower prices will likely boost consumer sentiment and increase consumer spending, which is great news for U.S. businesses. On the other hand, companies that depend on higher oil prices (such as domestic oil producers) will struggle. The Fed continued to be a major player in 2014; after welcoming new Chair Janet Yellen in February, the Fed continued to taper its monthly bond purchases before completely ending QE programs at the end of October. They cited improving labor market conditions as well as general optimism about economic growth in their decision to end stimulative monetary policy. The Fed's move was widely anticipated and markets reacted positively to this endorsement of the economy's health. The Fed's next move will likely be to raise interest rates. Though we don't have any solid dates from the Fed, some insiders believe that the overall strength of the economy may allow the central bank to raise rates as soon as the spring of 2015. The decision certainly isn't set in stone; Fed Chair Janet Yellen has repeatedly emphasized that all future moves will be data dependent. How will the Fed's moves affect bond yields? Expectations of a rate hike will likely affect short-term yields, but long-term bonds are much harder to predict. Tepid inflation and foreign demand for U.S. bonds could end up having a greater effect on long-term yields. 2014 was a very good year for the U.S. economy. Though the unseasonably cold weather caused by the "polar vortex" chilled economic activity in the first quarter, gross domestic product rebounded significantly in later quarters. Though we don't have fourth quarter data yet, some analysts believe that economic growth slowed at the end of the year. Given the rapid pace of growth in the second and third quarters, this would not be a surprise, but would still put the economy on an upward trend. 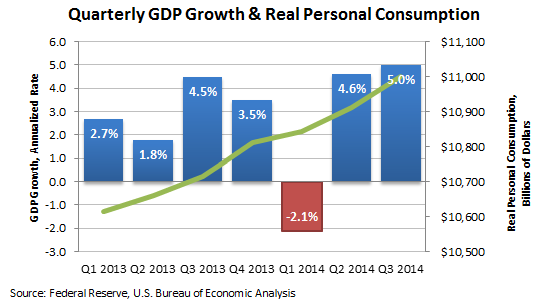 Consumer spending, the biggest engine of economic growth in the U.S., also made gains. Though tepid wage growth remained a concern, personal income and consumption rose throughout 2014 as Americans earned and spent more. The same trend was visible in sales of big-ticket items like autos, which saw an uptick as American consumers caught up on major purchases. The labor market also made tremendous progress last year. The economy started the year with 6.6% unemployment and trimmed it to 5.8% by November. The job market also reached an important milestone in 2014: regaining all of the estimated 8.7 million jobs lost in the recession. All told, the economy added over 2.5 million new jobs in 2014. Just as importantly, the quality of available jobs increased, giving more Americans the chance to leave low-paying or part-time jobs for better opportunities. Improvements in the labor market translated into stronger consumer sentiment in most of 2014. Americans became more optimistic about their economic prospects and official measures of consumer confidence soared to the highest levels since before the recession. Overall, Wall Street is cautiously optimistic about markets in 2015. A poll of 15 top Wall Street analysts showed average expectations of about a 6.0% gain in the S&P 500 this year. As always, it's best to take these predictions with a grain of salt. Projections this early in the year are nebulous at best, and we learned in 2014 that markets can turn on a dime. The best we can do is to take a look at underlying factors and think about how they may affect market performance. Investor exuberance pushed stocks to new highs in the final days of 2014 and markets may give way to volatility or a short-term pullback. It's not uncommon for investors to retreat and take stock of conditions after a prolonged rally. Economic fundamentals remain solid and positive fourth quarter earnings may push the rally higher. Alternatively, investors may give in to global worries and retreat. 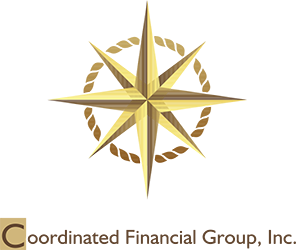 As always, we encourage our clients to take these market movements in stride and focus on making the most of opportunities as they present themselves. Manufacturing activity falls to six-month low. The pace of growth in manufacturing dropped off in December, possibly because of worries about weak global growth and falling oil prices. New orders fell dramatically, though employment rose slightly, indicating factories may still be hiring. Pending home sales edge up in November. Despite favorable mortgage rates, the number of signed contracts for houses bumped up just 0.8% from October numbers. On the positive side, this is the third straight month of gains in pending home sales. U.S. dollar reaches nine-year high. The dollar reached its highest level since 2006 against a basket of currencies as demand for U.S. assets grew amid concerns about economic growth in other countries. A slide in the euro also contributed to the dollar's strength. Weekly jobless claims rise more than expected. The number of unemployed Americans filing for new benefits rose after four straight weeks of decline. However, seasonal factors may be a factor and underlying trends are consistent with broad labor market growth.